Help me get to NYFW. I was very excited to be asked to take part in this particular Wallis Blogger contest. Wallis will sponsor the winner to go to NYFW...my dream. Yes, I live in NY, and yes, I have been lucky enough to attend fun events during NYFW but I have yet to get inside those tents. This has been a lifelong dream and you could help me get there! Being currently sick and home-bound with Lyme Disease and starting IV antibiotics next week, this would really boost my spirits and be something to look forward to after all this treatment is over...did I get your sympathy vote yet..I know I'm bad. But it is all true..this would be amazing. I decided to pick this Kimono top to style. I styled it with my favorite tuxedo pants for a clean look. Next Monday I will be styling it a bit more transitionally. If you like my look, or just feel bad for me, either way, I would LOVE for you to vote for me HERE. This entry was posted on Tuesday, August 13, 2013 and is filed under black,neon,wallis,white. You can follow any responses to this entry through the RSS 2.0. You can leave a response. Love the outfit! I'll make sure to vote! this outfit is AMAZING girl!! i love that top!! you look gorgeous. this is such a classic and effortlessly chic look. i hope you win!!! This outfit is gorgeous! 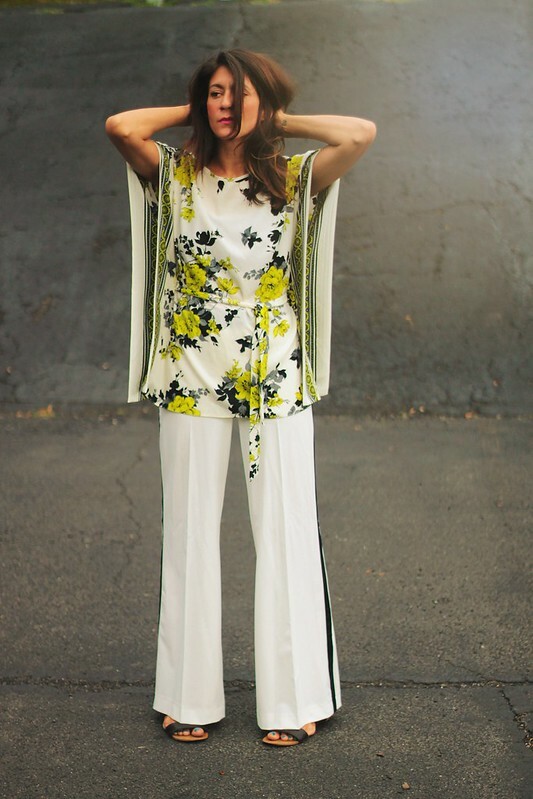 I love the tuxedo pants paired with a kimono style top. Good luck with the contest, I'll be sure to vote! Cute top, Sheree! Going to NYFW would be a DREAM!! Headed over to go vote now!! I love how you paired the printed top with the tuxedo pants! So chic! Ahhh!! This outfit is amazing!! Those pants are awesome with that top. You got my sympathy vote lol. Seriously though, awesome outfit - have voted. You look gorgeous in this!! Love the look and mix of prints :) Can't wait to see you in NYC in less than a month! Love how you transformed that lovely kimono Sheree.... Get well soon & good luck I'll pray you get to go the NYFW!! I can't get enough of this outfit, the black and white and pop of neon green is just sheer perfection. Gorgeous composition. So glad to have found your blog! Voted! I'm obsessed with those pants!